The Mount Washington Auto Road is a scenic drive up New Hampshire’s Mt. Washington. Mt Washington, at the center of the White Mountains National Forest, boasts a summit of nearly 6,300 feet. Cars and drivers who reach the top may purchase the famous “This Car Climbed Mt Washington” bumper sticker at the Summit Stage Office, which is now a small museum and store. The drive up Mount Washington allows visitors to pass through several different climate zones and take in dramatic views. Weather and foliage is constantly changing, and trees disappear once an altitude of approximately 4,200 feet is reached. The grade of the road averages 12% and is mostly paved, save for one mile of hard-packed gravel halfway to the summit. The road is open to vehicles from early May through October, weather permitting. The drive begins in Gorham at the Great Glen Base Lodge. The Lodge is home to the Glen Café and serves as a hub for Nordic skiing and outdoor adventures. Tip Top House stands at the summit. The former hotel was built in 1853 and is believed to be the oldest surviving example of summit hostelry in the world. Today, it houses a small museum of exhibits on the Mountain’s history. Also at the summit is the Mt Washington Observatory, a private weather observation station. Built in 1932, it is the first mountain top weather station in the world. The Summit Stage Office, originally the ticketing office for the Cog Railway, is famously chained to the ground for extra protection from the notoriously windy and ever-changing weather at the summit. The building recorded the world’s highest wind speed ever observed by man, at 213 miles per hour, in April of 1934. 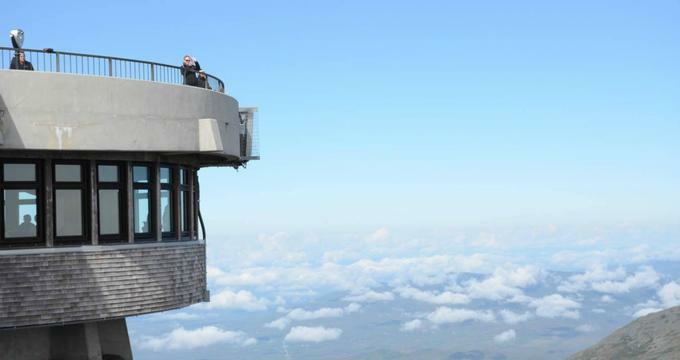 Views from the summit can reach as far as 130 miles on a clear day, as far as the Atlantic Ocean. History: The Mt. Washington Auto Road is the United States’ oldest man-made attraction. The road opened August of 1861. Early visions from 1850 included horse-drawn passenger coaches, which would take visitors to a hotel and observatory at the Mountain’s peak. Construction of the road began in 1854. Laborers worked up to 12 hours per day, and lived in small shanties nearby. All major work had to be done by hand, and in the years before dynamite, blasting was done with black powder placed in hand-drilled holes. In 1856, when the road was halfway to the summit, money ran out and construction ended. In 1859, the Mount Washington Summit Road Company was formed and construction resumed. The road was immediately popular and doubled in business each year until 1869, when the new Cog Railway opened on the west side of the mountain. To lure guests back the road from the railway, the Road Company built the Summit Stage Office shortly thereafter. The onset of the motorized vehicle was a game changer. In 1899, Freelan Stanley of Stanly Steamer fame drove the first motorized vehicle to the summit. The first gasoline powered vehicle reached the top in 1902. Today, over 45,000 cars and motorcycles climb to the summit each year. Ongoing Programs and Education: For visitors who opt not to take their own vehicles to the summit, several guided tours are available. Two hour guided tours combine a 30-minute ride to the summit in a 12-passenger van with one hour of time at the top to explore the historic buildings, visitor center and museum. Three-hour adventure tours are available during the summer months only and include options to exit the vehicle for short hikes on the way to the summit. Guides discuss local flora and fauna on the brief walks. During the winter months, Snow Coach Tours take guests to the tree line on a 12-passenger vehicle outfitted with snow rather than wheels. Bicknell’s Thrush Tours in early June visit the breeding grounds of one of America’s most rare and secretive Thrushes. The birds nest above 3,000 feet, only in the northeastern United States, to take advantage of the high moisture. Annual events abound. Highlights include ‘North America’s Toughest 10k,’ which takes place each March. Participants ski, snowshoe, or ride fat-bikes to the summit. The final 6,000 meters of the race climbs over 2,200 feet. Ride to the Sky closes the road to cars and opens it up to motorcycles only for a weekend each June. Alton Weagle day celebrates “first ascents” each May. Creative first ascents have included first to walk backwards, wear a Daffy Duck costume, ride a pogo stick or push a wheelbarrow.